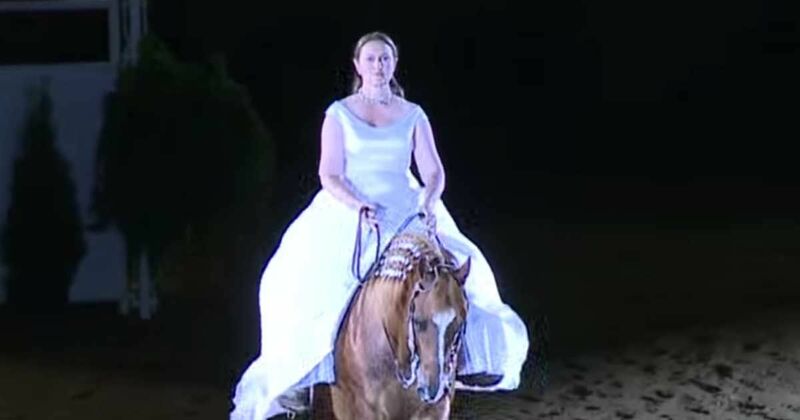 Heather Johnson and her horse, Double, left the audience in awe when they took to the arena in a reining routine dedicated to her aunt and her partner at the Kentucky Reining World Championship in 2014. Watch as Double does a half pass towards the front of the stadium. Perfectly matching the tone of the music, the horse appears to strut with attitude. Johnson and her horse then completed various required moves including several trot styles, lead changes and rundowns. Set to the song "Same Love," by Macklemore and Ryan Lewis, Johnson and her horse mesmerize the crowd with breathtaking runs, sudden stops, and heart-stopping spins. Johnson and Double competed in the freestyle reigning competition. This competition lets owners show off their horse's ability to perform athletic feats. Reigning is reserved for "ranch-type" horses, according to the National Reigning Horse Association. Competitors are required to include certain moves including spins (in both directions), lead changes, rundowns and stops, according to Horse and Rider. Riders can include other moves like circles, rollbacks and two-tracking. Johnson and her horse scored 225 points. All horses enter the arena with a score of 70. Points are then added and subtracted for each move. A score of 70 is considered average (the horse did all the right moves but didn't attempt anything more difficult), according to USA Reining. Watch their stunning performance below, and be sure to SHARE this video with your friends.